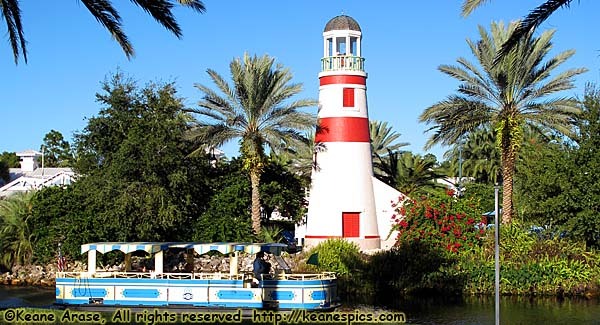 Old Key West Lighthouse, and the Downtown Disney water taxi. 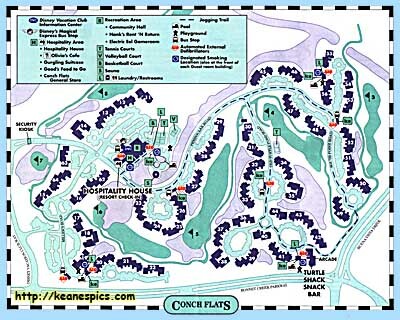 Old Key West opened in 1991, and was Disney's first foray into the Disney Vacation Club, and indeed was named "Disney's Vacation Club Resort" until 1996. In many ways, it shows. Because they wanted to make DVC Villas a "home-away-from-home" and not a motel room, they created creative, angular rooms rather than rectangular boxes. While creative, 20 years later, there isn't enough continuous wall space to put a widescreen TV in the studio villas. (I am told this problem has been solved.) The resort claims the largest square footage of any of the DVC resorts, but much of this space seems lost due to the design. There's a more detailed description of my stay here in my December 2010 Trip Report. I was in building 27 in room 2726. Second floor. My room was a studio, but part of a 2-bedroom lockoff. (A lockoff is where a 1-bedroom villa and a studio can be connected though a locking doors. It's the door next to the table in the pictures below.) So rooms 2725 and 2726 were the only doors on the second floor landing where I was, but both would go to the same 2-bedroom villa should Disney want to configure it that way. For some reason, the Old Key West lobby/pool area feels a little cramped (maybe small is a better word) compared to the other resorts I've been to. Again, maybe it's because of where it's situated, between a waterway and a fairway. The table service restaurant at Old Key West is Olivia's. It was very good, though we only ate there for breakfast. There is an outside snack bar, but otherwise no counter service restaurant. This doesn't seem to be unusual at DVC resorts.